In the 1860s, America decided that it was going to become a modern nation, or in other words one unified by ideology, economics, and bureaucracy instead of a government which served in a custodial role to a pre-government civilization, comprised of a nation or group of ethnically-related people. This formalized the takeover over of the means of governing from the governed. In other words, the system became more important than its objective; the tool became the master and the master the slave; the process took precedence over the reasons why; the inner was subverted by the outer; form took over from function; we missed the forest for the trees; we got tunnel vision; we killed the goose that laid the golden eggs; we forgot that the path to hell is paved with good intentions. Formalized through the Civil Rights Act and later the Fourteenth Amendment, this new agenda was simple: government must enforce equality, which requires preventing any private actors from doing anything which might result in inequality. Under the new regime, you could not refuse to sell to, hire, associate with, or rent to a black person. You could not speak openly of your opposition to civil rights, lest this be inferred to be prima facie proof that you were discriminating with your business. If you did not have black people in your business, neighborhood, apartment block, and organization, it was also considered prima facie proof that you were a “racist.” Through the doctrine of “disparate impact,” which took some time to fully formulate but always existed, anywhere where white people were thriving and black people were not was assumed to be in the grips of horrible racists. The system liked civil rights because they gave the system power to peer into every aspect of life and regulate it. Even more, it forced citizens into a mode of offering up presumptive proof of their non-“racism,” a model which could later be repeated with anything else that government wanted. It also provided government with a template: identify a harm, demonize it, and use that as an excuse to destroy anyone who resisted government control and then make them de facto slaves with your legal system. Since the American South had escaped the economic and social system of the North, it was declared evil and destroyed. The same applied to the Vietnamese, Germans, Spanish, smoking, conservatism, Christianity, heavy metal, fat, drunk driving, and eventually, noticing any exceptions by the order of nature to the dogma of equality. We call this an offshoot of Crowdism because in any human organization, once stability is achieved, all of the people who have not found a place gather in a freaks, geeks, and misfits arrangement to take over control from the less-unified people who have found places. The dropouts have something unifying them where the majority does not, being actually diverse in behavior and intellect, but through ideology, the dropouts become aligned into a dark organization or cancer which then takes over the organization or nation that is its host. This happens time and again in human history because of our tendency toward individualism, which paradoxically leads to herd behavior, and therefore turns us away from our objectives and toward the feminized, bureaucratic, passive, and hubris-laden notion of ensuring safety, plenty, and social equality for all in lieu of having an objective and succeeding at it. After WW2, the entire West swung to the Left in order to compete with the threat of Communism, which was offering things that seduced voters like safety nets, and in order to distinguish itself from anti-democratic and nationalistic ideas, which were rising in response to the failure of democracy to do anything but endlessly bicker, write laws, file lawsuits, fine people, and drown everyone in bureaucracy and taxes. This followed what also happened in the 1840s in response to rising Leftist revolutions, the 1920s after WW1 and the hopeless that people misattributed to capitalism instead of blaming democracy, and even the backlash to the war of 1812, after which America adopted more egalitarian policies in order to avoid having angry voters overthrow The System. With the West going Leftist, it used the one weapon it had against the Soviets: they may offer you free stuff, but we offer you freedom, and to prove that, we will make all different races equal and live in a Tower of Babel styled religious, ethnic, and racial wonderland. While the Soviets claim to make everyone equal, we actually do it, by giving everyone freedom and then setting up an entitlements state in the 1930s-1950s which effectively rivaled anything the Soviets could offer. The voters wanted free stuff, and they would not figure out that this was a trap until 2025 when all the government systems went bankrupt at roughly the same time (warning: spoilers). In order to formalize this, the West began making concessions to minority groups starting in the 1940s with the first instances of affirmative action, then accelerating this in the 1960-1965 period with the work of the Kennedys and the Hart-Celler Act. This later gave way to revolutions across the West in 1968 that dethroned the indigenous and replaced them with the mixed-ethnic white group — generic “whites” — who promptly voted to include everyone else as well. This movement needed new heroes to compete with Lenin and Washington, and it adopted Martin Luther King, Jr., first among them. If the West has a new false Jesus, King takes that role, coming before any other because he suffered not just poverty and government discrimination, but actual racism. By raising him to the head of our pantheon, we affirmed our commitment to Leftism enforced on us through the legal means of civil rights. During his third year of doctoral work at Boston University, Martin Luther King wrote Crozer Theological Seminary’s George Davis, his former advisor, about his progress in graduate school. He disclosed that he had begun to research his dissertation and that the late Edgar Brightman, his first mentor at Boston, and his current dissertation advisor, L. Harold DeWolf, were both “quite impressed” with his course work. “So far, my Dissertation title is: ‘A comparison of the conception of God in the thinking of Paul Tillich and Henry Nelson Wieman.’ I am finding the study quite fascinating. If there are no basic interruptions, I hope to complete it by the end of the coming summer” (Papers 2:224). Davis commended King on selecting “an excellent dissertation topic” and expressed his confidence that King would ‘‘do a good piece of work with it” (Papers 2:225). King passed his final doctoral examination in February 1954, and his dissertation outline was approved by Boston University’s graduate school on 9 April, shortly before he accepted the call to pastor Dexter Avenue Baptist Church. King’s letter of acceptance to Dexter’s congregation specified that he be “granted an allowance of time to complete my work at Boston University,” though he would be “able to fill the pulpit at least once or twice per month.” He also asked that the church cover his expenses during the completion of his dissertation, “including traveling expenses” (Papers 2:260). King chose to focus his dissertation research on Tillich and Wieman due to their status as influential religious thinkers and as representatives of divergent views on the nature of God. King’s comparison of Tillich’s and Wieman’s concepts of God reflected his adherence to personalism, which proceeds from the belief that God possesses a personality and can therefore have a relationship with human beings. King’s analysis of Tillich’s and Wieman’s theological concepts as “unsatisfactory” and “inadequate a philosophical and religious world-views” followed from his belief that God was a living force, “responsive to the deepest yearnings of the human heart; this God both evokes and answers prayer” (Papers 2:532; 533; 512). He found that both Wieman and Tillich rejected the conception of a personal God, which resulted in “a rejection of the rationality, goodness, and love of God in the full sense of the words. An impersonal ‘being-itself’ or ‘creative event’ cannot be rational or good, for these attributes are of personality” (Papers 2:506). In the end, King pointed out the two theologians’ views of God are not “basically sound” because they ‘‘render real religious experience impossible’’ (Papers 2:532). Recent scholarship by the Martin Luther King, Jr., Papers Project of the King Institute has revealed that as a student at Crozer and Boston, King frequently appropriated the words of other writers without proper attribution. Volumes I and II of The Papers of Martin Luther King, Jr. have demonstrated that while his bibliographies contained the authors and books that he drew on in his own compositions, his papers often lacked the footnotes and quotation marks that identified his use of these sources in his text. His habit of plagiarizing others’ work, intentionally or not, can be found in the various drafts of his dissertation. King borrowed from several secondary sources without proper citation, including a dissertation written by fellow Crozer student Jack Boozer for DeWolf three years earlier, and a review of Tillich’s Systematic Theology written by one of King’s former professors. King’s professors did not detect this pattern in his scholarship. After King submitted the first draft of his dissertation, DeWolf filed a report observing that he had sent his specific criticisms, “most of them formal or minor,” to the candidate. DeWolf reminded King to submit an abstract of the dissertation “early” to allow proper time for revision and to clearly set forth his thesis statement (Papers 2:333). That said, DeWolf projected that the finished version would be an “excellent and useful scholarly achievement” (Papers 2:334). S. Paul Schilling, the dissertation’s second reader, approved the draft as well. King turned in the final version of his dissertation by the 15 April 1955 deadline, returning to Boston for his oral defense. Graduate faculty at Boston University voted to confer the PhD on King in May 1955; however, due to financial difficulties and Coretta Scott King’s pregnancy, he was unable to attend graduation. Carson et al., “Martin Luther King, Jr., as Scholar: A Reexamination of His Theological Writings,” Journal of American History 78 (June 1991): 93–105. Davis to King, 7 December 1953, in Papers 2:225–226. DeWolf, First Reader’s Report, 26 February 1955, in Papers 2:333–334. King, “A Comparison of the Conceptions of God in the Thinking of Paul Tillich and Henry Nelson Wieman,” 15 April 1955, in Papers 2:339–544. King to Davis, 1 December 1953, in Papers 2:223–224. King to Dexter Avenue Baptist Church, 14 April 1954, in Papers 2:260. King Papers Project, “The Student Papers of Martin Luther King, Jr.: A Summary Statement on Research,” Journal of American History 78 (June 1991): 23–31. Schilling, Second Reader’s Report, 26 February 1955, in Papers 2:334–335. King frequently appropriated the words of other writers without proper attribution. Volumes I and II of The Papers of Martin Luther King, Jr. have demonstrated that while his bibliographies contained the authors and books that he drew on in his own compositions, his papers often lacked the footnotes and quotation marks that identified his use of these sources in his text. His habit of plagiarizing others’ work, intentionally or not, can be found in the various drafts of his dissertation. King borrowed from several secondary sources without proper citation, including a dissertation written by fellow Crozer student Jack Boozer for DeWolf three years earlier, and a review of Tillich’s Systematic Theology written by one of King’s former professors. In other words, he systematically included the work of others as his own when he did not have content. This is not a typo or a glitch, but a habit, and indicates not only dishonesty, but a lack of ideas. Far from being a visionary, he was a con man. The historian, Clayborne Carson, a professor of history at Stanford University who was chosen in 1985 by Dr. King’s widow, Coretta Scott King, to head the King Papers Project, said that analysis of the papers by researchers working on the project had uncovered concepts, sentences and longer passages taken from other sources without attribution throughout Dr. King’s writings as a theology student. Mr. Carson and other scholars who have seen the papers declined to say how great a percentage of the material had been plagiarized, but they said it was enough to indicate a serious violation of academic principles. Fifteen years ago, with Stanford’s Clayborne Carson, I was responsible for directing research on Martin Luther King’s early life for the Martin Luther King Papers Project. If anything, the pattern seemed to be that the more familiar King was with a subject, the less likely he was to plagiarize. On matters that were fairly alien to his experience, he borrowed heavily from others and often with only the slightest wink of attribution. To take two extreme examples, an autobiographical paper,”Autobiography of Religious Development” has no significant plagiarism in it; his paper on”The Chief Characteristics and Doctrines of Mahayana Buddhism,” however, is composed almost exclusively of paragraphs lifted from the best secondary sources available to him. Moreover, the further King went in his academic career, the more deeply ingrained the patterns of borrowing language without clear attribution became. Thus, the plagiarism in his dissertation seemed to be, by then, the product of his long established practice. The other thing that I think was going on, particularly in King’s later academic career, was that he was being patronized by his liberal, white professors. That clearly was not the case when his undergraduate teachers at Morehouse evaluated his work. But when he went to predominately white institutions in the North, King received extra-ordinarily high grades for academic work which was not only often heavily plagiarized, but was otherwise quite unexceptional. Far from an innovator, King was in fact merely bleating what was passed on to him by his white Leftist mentors, synthesizing it into a mundane average: Christianity demanded the equality of all men, therefore a diverse society which prioritized the underdog was Christian, and therefore we should all turn to the Left using the magic of civil rights. In 1964 King told an audience in Jackson, Mississippi, he was “sick and tired of people saying this movement has been infiltrated by Communists … There are as many Communists in this freedom movement as there are Eskimos in Florida” (Herbers, “Rights Workers”). In 1963 King bowed to the wishes of the Kennedy administration and fired SCLC employee Jack O’Dell after the FBI alleged that he was a Communist. King also agreed to cease direct communication with his friend and closest white advisor, Stanley Levison, although he eventually resumed contact with him in March 1965. FBI surveillance and bugs tracked King’s political associations and produced evidence of King’s extramarital sexual activities—information that was later leaked to some reporters. In 1965 King faced questions from journalists on Meet the Press about his association with Tennessee’s Highlander Folk School, which had been branded a “Communist training school” on billboards that appeared throughout Alabama during the Selma to Montgomery March and showed King attending a Highlander workshop. The FBI knew, in copious firsthand detail from the Childs brothers, that Levison had secretly served as one of the top two financiers for the Communist Party USA in the years just before he met King. The information that Jack and Morris Childs furnished the FBI, from 1952 to 1956, about their repeated face-to-face dealings with Stanley Levison concerning CPUSA finances establishes beyond any possible question that Levison in those years was a highly important Party operative. Among the top contributors, Jack said, were Stanley and Roy Levison, twin brothers who owned a Ford dealership in northern New Jersey that contributed well over $10,000 a year to the CPUSA. Levison, the FBI told Kennedy and Marshall, had recently installed as head of the SCLC’s small New York office a young African-American man named Jack O’Dell, whose publicly documented record of affiliation with the CPUSA had drawn the attention of hostile congressional committees just a few years earlier. In other words, a former titled Communist operative found his way into the King organization and hired another to further cement the influence of far-Left thought in the civil rights movement. Although Jewish, Levison had the endorsement of a range of white Communist, Socialist, and Leftist supporters. America worships a false hero in Martin Luther King, Jr., but the blame is found with white Leftists and not King himself. Groomed for a role, prompted on what to say, and his incompetence and malfeasance deleted from the record, King served the role that American Leftists need. 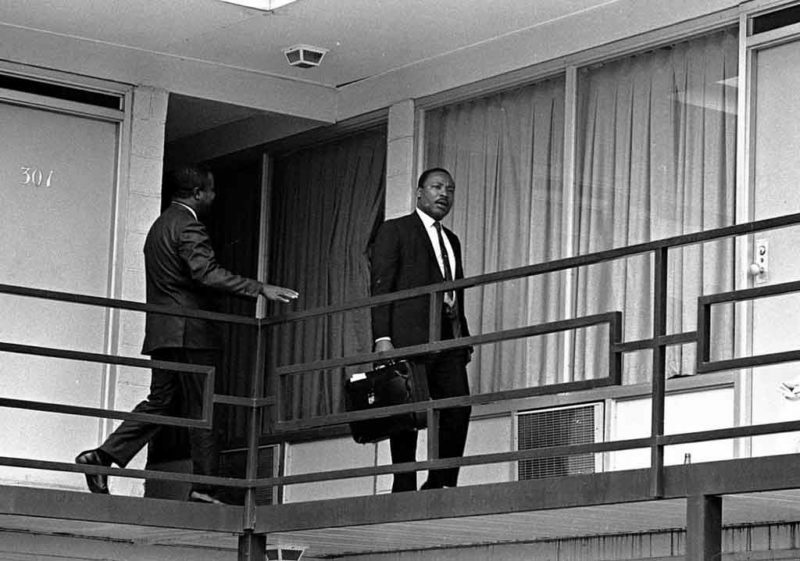 If we take that as seriously as we should, we realize that the entire civil rights movement was a lie, simply the next pretext of a growing deep state of bureaucrats, Leftists, and other power-hungry people who saw that the way to seize a nation was through its soft and generous heart.